All Alone in a Small Island, by Frances (2018). 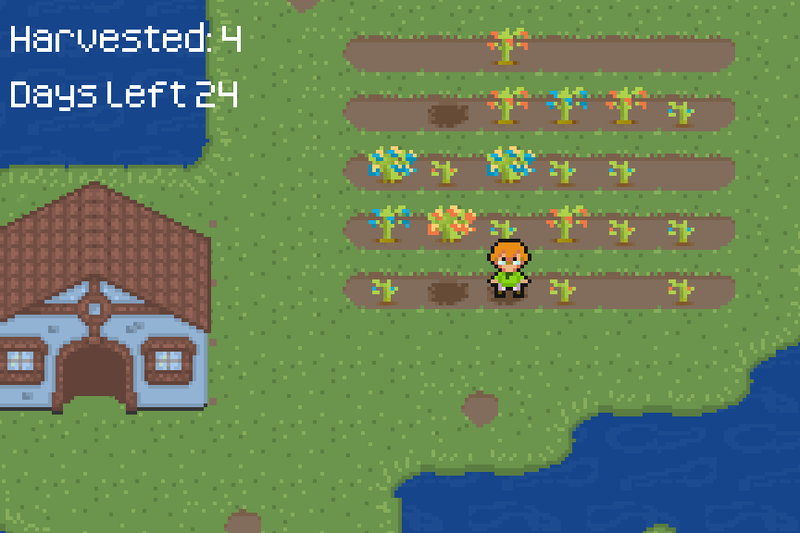 Created for a weekly game jam at itch.io under the theme “Small World,” Frances’s game looks at first blush like a Harvest Moon-type of time management and gardening game. That’s not entirely inaccurate, either, and the game is working with that genre in the backdrop. When you first load it, the game gives you an impressive diversity of avatars to choose from and tells you that you’re about to participate in a rite of passage for your culture. This is a challenge to spend 30 days on a tiny island all by yourself, staying in the island’s only building, with the objective of raising one hundred orange flowers by month’s end. What the game does with this setup is special and unique and opens up a space for an examination of ritual, routines, goals, and the individual’s place vis-à-vis society. It’s striking that while the game’s days count from thirty down to zero, the days themselves do not have time or action limitations. Suggestive text appears when you retire to your hut every night, reinforcing the themes it raises with the word “Alone” in the title, while allowing enough space with its evocative second-person language to give space to insert yourself into the narrative. How will you fill your days? How do you have a game like Harvest Moon or Stardew Valley–each of which emphasizes community as much as farming–when you’re, in fact, “All Alone in a Small Island?” I’d say more, but I think this is a game that is best not to spoil–its particular rhythms need to be experienced for themselves. Suffice it to say that the framing device, for me, ultimately surpasses the core “challenge” of the game. I believe this game will stay with me for a long time. Download the game for Windows from itch.io.